Defence Infrastructure Organisation (DIO) is the UK Ministry of Defence's property and services provider. It exists to support Britain's military personnel in preparing for operations. DIO does this by providing and maintaining the places where the military lives, works and trains. The UK's defence is DIO's business and the organisation ensures that MoD infrastructure is fit for the job that needs to be done. It does this by understanding defence requirements; articulating these needs; commissioning the necessary infrastructure and services; and ensuring that these outcomes are delivered correctly. Among DIO's main objectives is to develop construction and maintenance standards and practices for airfield pavements which meet functional requirements, minimize whole life costs and disruption for maintenance and address sustainability issues. 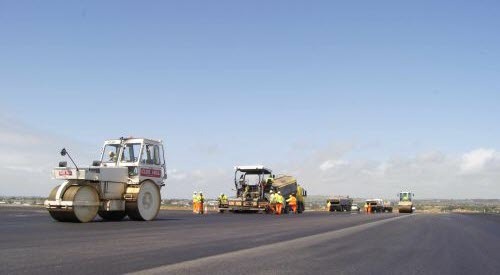 Debut Services (South West), DIO's prime contractor in the south west of England, commissioned Bardon Contracting to resurface the 1835m long main runway at Culdrose in Marshall Asphalt. The same contracting team then improved both the northern and southern taxiways with SMA and is renewing two secondary runways with Marshall Asphalt. Marshall Asphalt is one of DIO's principal materials for airfield resurfacing work with its long track record of providing a robust and very durable surface course and meeting all of the organisation’s requirements. However if by using polymer modified binders DIO can improve Marshall Asphalt's resistance to reflective cracking at low temperatures, then this could provide a significant gain in value for money. Marshall Asphalt is a tried and tested high strength material which is normally renewed around every 12 to 15 years. Bardon Contracting, supply chain partner to prime contractor Debut Services and which carried out the surfacing, was confident that the use of polymer modified binder could further extend the life of runways. Polymer modified bitumen for the taxiway improvements was supplied by Nynas and incorporated into asphalt designed by Aggregate Industries. Nynas Endura Z2 was chosen for the contract to ensure that the surfacing resists rutting that can be caused by tightly turning aircraft using taxiways at low speed. The bitumen was mixed with hard wearing Cornish dolerite to produce an SMA surface course, laid to a depth of 50mm over an SMA binder course of the same depth. "Polymer modified binder used within an SMA ensures a surfacing material has added cohesion and adhesion – and this is particularly important for airfields," said Nynas asphalt engineering support manager Jukka Laitinen. "We carried out a comprehensive set of specialist tests as per the contract specification, which have included low temperature indirect tensile strength tests after ageing at -18ºC." Surfacings at Culdrose were in a poor state. The airfield opened in 1947 and has received numerous treatments since, including several applications of slurry seal surfacing that were beginning to delaminate and flake off. This presented a risk of FOD (foreign object damage) potentially causing problems for the safe operation of aircraft. Download this information on how Nynas Endura Z2 was used at the Royal naval air station, Culdrose, UK, as a pdf.